Mixere is a free, open-source application for mixing audio files. It runs on Windows NT/2000/XP, and supports WAV, AIFF, MP3, Ogg Vorbis, Flac, and Mod audio files. Mixere is ideal for live performance, and especially for creating multi-layered sound collages. It's like a rack full of CD players connected to an automated mixer. 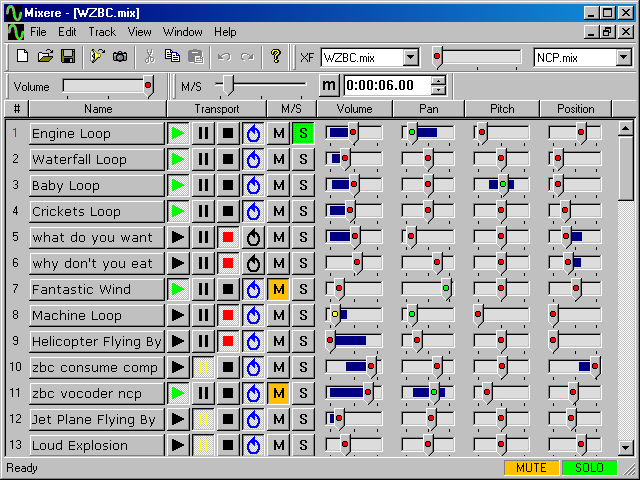 Features include: dynamic looping and triggering of audio - automated volume, pan, and pitch sliders - soft (gradual) mute/solo operations - crossfading between documents - snapshots, for rapid scene changes - unlimited undo - clipboard support, drag and drop - variable automation waveforms - intuitive and easy to learn - comprehensive help - low CPU/memory usage - unlimited audio file size - no installer, standalone .EXE file. A Mixere document consists of a number of tracks, each containing a single audio file. Any number of tracks can play simultaneously, subject only to Windows and sound card performance limits. Audio is streamed directly from disk, so there's no limit on audio file size, and no waiting for audio to be loaded into memory. Mixere's interface is similar to a spreadsheet. The rows are tracks, and the columns are properties which can be adjusted for each track: name, transport (play/pause/stop/loop), mute/solo, volume, pan, pitch (two octaves), and audio position. Mixere doesn't record, but its output can be captured using a third-party audio capture tool, such as River Past Audio Capture (highly recommended!). Mixere doesn't use much CPU or memory, so it coexists peacefully with other audio applications. Mixere is licensed under the GPL, and uses an open-source audio library called Audiere. It's a standalone executable, so there's no installer. Try it! If you don't like it, just delete it.